We want to thank our patients and surrounding communities for another wonderful year! We are Eye Care Providers who really do care about our patients. 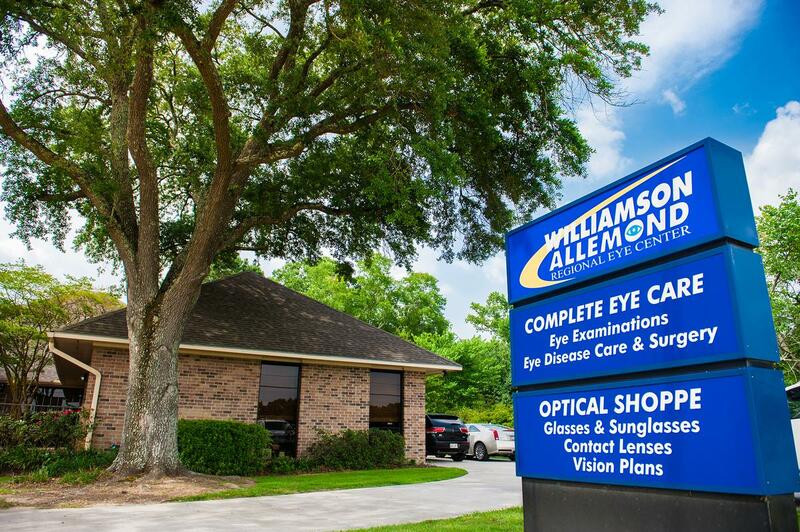 At the Williamson Allemond Regional Eye Center, our patients come first. We strive to provide the best possible Customer Service and Eye Care in south Louisiana region. Not only do we exceed the expectations of our customer's Eye Care needs, we also offer State-Of-The-Art Testing that can detect Eye Diseases and other Eye Problems 10 to 15 years in advance! Catching Eye Problems early can save sight! Did you know that we perform Eye and Facial Surgeries right here in Zachary? If you or a loved one is experiencing Vision Problems due to Cataracts or Droopy Eyelids there is no need to go to Baton Rouge for surgery! We have Eye Specialists and Facial Cosmetic Surgeons who care about your health and offer treatment right here in your hometown. Not only do we provide Eye Exams, Testing and Eye and Facial Surgery in Zachary, we also have a fully stocked, high fashion, low cost Optical Shop that offers Glasses, Sunglasses and Contact Lenses. We even offer our patients the ability to shop for these items from the comfort of their own homes by visiting www.The-Optical-Shop.com. We enjoy being accessible to you 24/7 for your Glasses and Sunglass needs! Welcome Dr. Katrina A. Mears Our New Retina Surgeon! 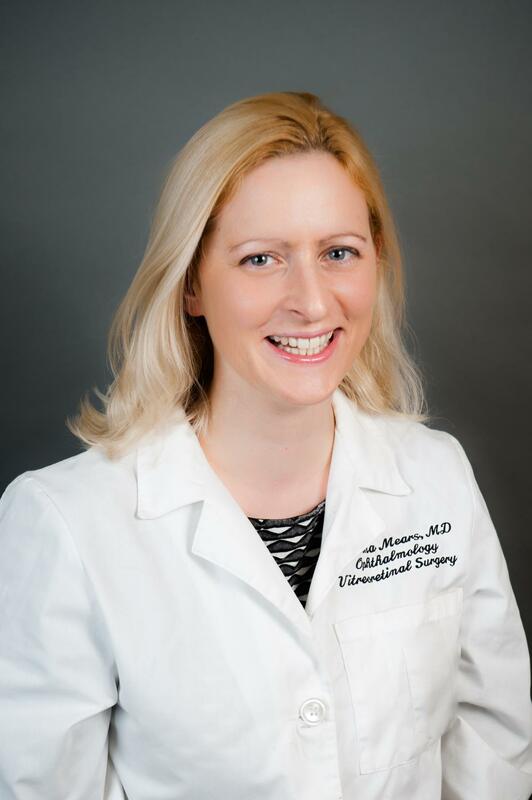 We are pleased to announce that Dr. Katrina A. Mears, Retina Specialist with Louisiana State University Health and Sciences Center has joined Drs. Baron Williamson and Jason Allemond at the Williamson Allemond Regional Eye Center located at 2421 Church Street in Zachary, Louisiana. Dr. Katrina A. Mears obtained her medical degree from the School of Medicine at the National University of Ireland Galway, in Ireland. She accomplished her Ophthalmology residency at the Kresqe Eye Institute at Wayne State University in Detroit, Michigan. Following this, she completed her fellowship in Vitreoretinal Diseases and Surgery in the Department of Ophthalmology and Visual Sciences at the University of Iowa Hospitals and Clinics, Iowa City, Iowa. She is Board Certified by the American Board of Ophthalmology and the Royal College of Ophthalmologists United Kingdom. She is a participating member of the American Academy of Ophthalmology, American Society of Retina Specialists, the International Society of Ocular Oncology, and the Royal College of Ophthalmologists United Kingdom. She has been published on multiple occasions. Dr. Mears says, “My philosophy is to treat patients the same way I would treat a member of my own family. 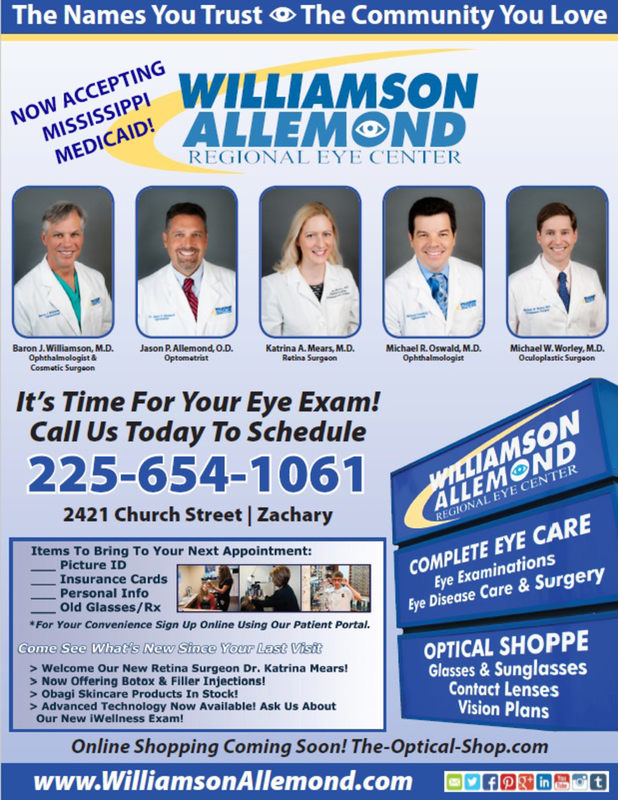 To schedule an appointment with Dr. Katrina Mears at the Williamson Allemond Regional Eye Center, please call 225.654.1061 or visit the company website at www.WilliamsonAllemond.com. It's that time of year again! I recently had another patient who has allergies, and she has tried several different types of Contacts but every pair seemed to make her eyes feel dry and tired only after a few hours. The patient said she spent most of her day working on a computer, and each time it would make her eyes dry and tired as well. Now we have solutions! There is a new Daily Disposable Contact that just came out called Acuvue Oasys 1 Day. These new Contacts have Hydraluxe Technology that helps the eyes feel comfortable throughout the day. The Contacts have a tear like property that works with your natural tear film all day long. The patient loved the Contacts and every other patient that I have fit in these Contacts have loved the Acuvue Oasys 1 Day as well. I am extremely excited about this new brand and would recommend it to any patient with dry eye issues! Call or Come See Me Today And We Can Fix You Right Up! IT’S CHRISTMAS TIME, SHOP NOW! Are you clueless as to what to get your special someone for Christmas? Give them the gift of SIGHT and STYLE! We have hundreds of fashionable eyeglass frames to choose from with prices that will fit your budget! Styles for Women from Vera Bradley to Guess to Tori Burch and much, much more! We have styles for Men from Cole Haan to Ray Ban to Gucci and many more! We also have an outstanding collection of stylish sunglasses to choose from with name brands such as Maui Jim, Costa and BeBe just to name a few! Does your special someone wear contact lenses? We have those too! We even have color contact lenses for those who want to enhance the natural color of their eyes or change up their look completely! Don’t know what exactly your special someone wants or needs? Give them a Gift Certificate to The-Optical-Shop in any amount you choose! Stop by to experience our exceptional customer service and give the gift of SIGHT and STYLE this holiday season! Call Or Come By Our Optical Shop Or You Can Even Visit Us Online! ENTER TO WIN! OBAGI Giveaway! For Our OBAGI Gift Basket Giveaway! *OUR DRAWING IS PLANNED FOR JANUARY 5TH 2016! DON'T YOU JUST LOVE PATIENT TESTIMONIALS? Please see the attached card that was sent to us by one of our patients who was operated on in September of this year. She had Cataract Surgery in both eyes, and she received the "Toric Lens" implants. The Toric & Restor Lenses are Advance Technology Lenses that our Surgeons can implant at the time of Cataract Surgery. They actually correct vision problems which normally would require glasses or contacts for life after surgery. Our "Miracle" Patient here had extremely bad astigmatisms in both eyes, and now she only uses reading glasses on occassion! She was so pleased with her outcome(s) that she sent us this card to thank Dr. Baron J. Williamson for performing her surgery, and with her permission, we are able to share her testimony with you. Another Satisfied Customer at the Williamson Allemond Regional Eye Center in Zachary, Louisiana.